Buying products in digital format has become at least equally popular as getting software, movies, music and books in tangible form. Only in the US the revenues generated by music streaming services reached $3.9 billion in 2016. It was more than 50% of the total music revenues in the USA that year. Similar trends are present in the sales of other digital products, as well. What’s interesting here is the way the IRS attributes taxes to digital products. The already complex taxation system in the States now has an additional feature – imposing taxes on intangible media features. The terms and tax rates are different from state to state. That’s why we’ve decided to provide you with the basic information about the taxes you’ll need to pay if you’re thinking about selling digital products in the US. Every single piece of art or bit of software that’s sold online, without its tangible counterpart is considered a digital product. As opposed to a printed book, a CD, or a record, here buyers get the product they’ve purchased via download or email. Also, the aforementioned streaming services enable their users to subscribe to their digital content and access it online, without downloading it. If you’ve ever used Netflix of iTunes, you know the drill. In a nutshell, everything you buy and use in electronic format can, but doesn’t have to be subjected to taxation. Online motion pictures, like movies and TV-series. Knowing this basic categorization of digital taxation will come in handy if you’re considering launching a career in the field of digital products. Now let’s move onto the rules and laws in different US states. 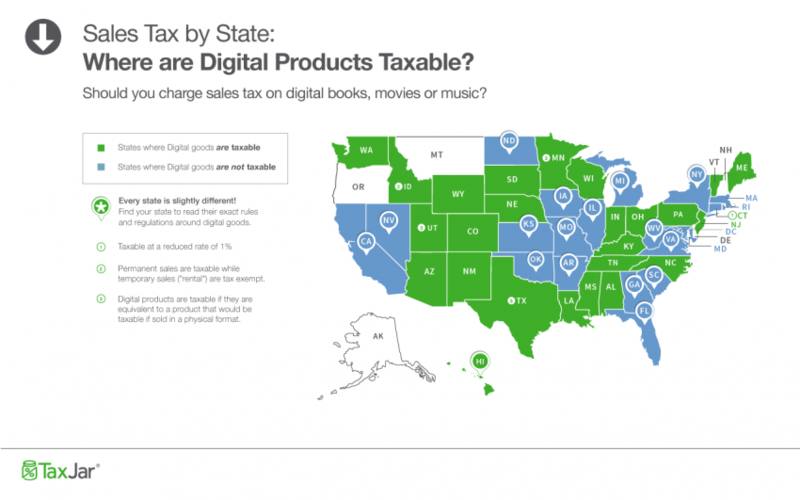 Some US states impose taxes on digital sales, while others keep that field tax-free. For instance, digital goods aren’t taxable in New York, Florida, California, and other 20 states that don’t impose any taxes on electronic goods. On the other hand, Texas, Pennsylvania, Wisconsin and 24 additional states have taxes for digital products. You can find out more about these two groups of states from the map available on the TaxJar website. When it comes to the states in which digital goods are taxable, the tax rates vary from 1% to 7%. Also, bear in mind that you’re eligible to pay taxes on digital products in a state that requires those taxes only if you’re physically present in that very state in any way whatsoever. This is officially called a tax nexus. It refers to any registered business feature you may have in a particular US state, from an office or a warehouse to official employees, affiliate partners etc. For example, if you have a legally registered affiliate subsidiary in Austin, Texas, every digital product you sell there will be taxed, even though your main office is, say, in San Diego. Although this might sound harsh, it has a positive side, as well: you can always move your business or some of its branches to the states that don’t require paying taxes on digital products. In that sense, the US still gives you the freedom of choice when it comes to digital products. When you start analyzing the details of digital taxation state by state, you realize that some parts of the US have really made it as complicated as it gets. Every US state is very proud of their level of autonomy and their local laws. Therefore, they react promptly if they think any branch of the federal government is trying to take away a single bit of their self-government. That’s why the two attempts made by Congress to bring a federal act on digital products – Digital Goods and Services Tax Fairness Act – that would be applied throughout the States have failed. The first one was rejected in 2011. The second didn’t pass in Congress in 2015. This common framework for all the US states would reduce the level of complexity and alleviate the taxation process both for sellers and buyers of digital products. Still, if you don’t live in such states, you won’t have to bother with untangling those complex regulations. You can simply launch a digital business and start (re)selling all sorts of digital goods. Nevertheless, your business is still eligible for other taxes, so make sure to fill out your tax return in a careful and meticulous way. Either way, you can always get an extra hand from a tax preparer and check what taxes you need to comply with if you’re selling digital products. Also, the Stripe Atlas tax guide is a great resource if you are a startup. The global nature of digital sales often produces interesting combinations that include sellers and buyers from different locations. For example, if you’re a seller who neither lives in the US nor has any business-related elements – the “tax nexus” from the second paragraph – in any of the US states, you don’t have to collect taxes from your US-based buyers. Still, you’re obliged to include all your revenues on your tax return and pay the due taxes in your homeland. As opposed to that, if you don’t live in the US, but you have a nexus in a US state that has taxes on digital products, you need to pay those taxes. Also, make sure to obtain a sales tax permit. Otherwise, you won’t have the right to collect the sales tax. Here you can check out what you need to register for a sales tax permit in the State of New York. Other states might have different procedures, so contact the local tax administration in the state of your interest and find out what’s the procedure. The US taxation system has always been strict but also confusing even for experienced entrepreneurs. The fast growth of the digital market has made the entire tax conundrum even more complex. That’s why digital entrepreneurs need to learn as much as possible about the tax regulations in different states. Also, wise businesspeople will always keep a tax preparer by their side, to cover all the bases and stay informed about all the tax demands. Only such a thorough approach to digital taxation will ensure that you fulfill your tax duties and run your business without any tax-related penalties. Mark is a biz-dev hero at Invoicebus - a simple invoicing service that gets your invoices paid faster. He passionately blogs on topics that help small biz owners succeed in their business. He is also a lifelong learner who practices mindfulness and enjoys long walks in nature more than anything else. The importance of content quality assurance is determined by the need to tailor content to a particular type of audience. It allows teams to make sure that their content not only is interesting and well-written but also serves its purpose. How to Determine and Finance the Working Capital Needs? Working capital determines the health of a small business. For every business, it is primary to determine the working capital needs and to find an appropriate way to finance them.